I was happy to receive a call on Thanksgiving day from Bayarsaihan. She is a native Mongolian that met her husband at BYU Hawaii and moved to Vancouver several years ago. I knew that she lived here, but despite all my efforts to contact her, I was never successful. She was told by a missionary serving in her ward that I would love to talk to her. On Saturday I called her and talked for 10 to 15 minutes in Mongolian and she invited us to her house to have some buuz (Mongolian food). I was so happy that I was able to understand still and that I hadn’t lost it all with the 8 months of not speaking to a native. Today is very exciting because we are going to her house and enjoying some food and my companions get to see how wonderful the culture is. It truly has made me very happy. 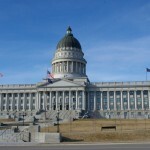 I look forward to meeting more Mongolians in Utah as I hear there are many there. 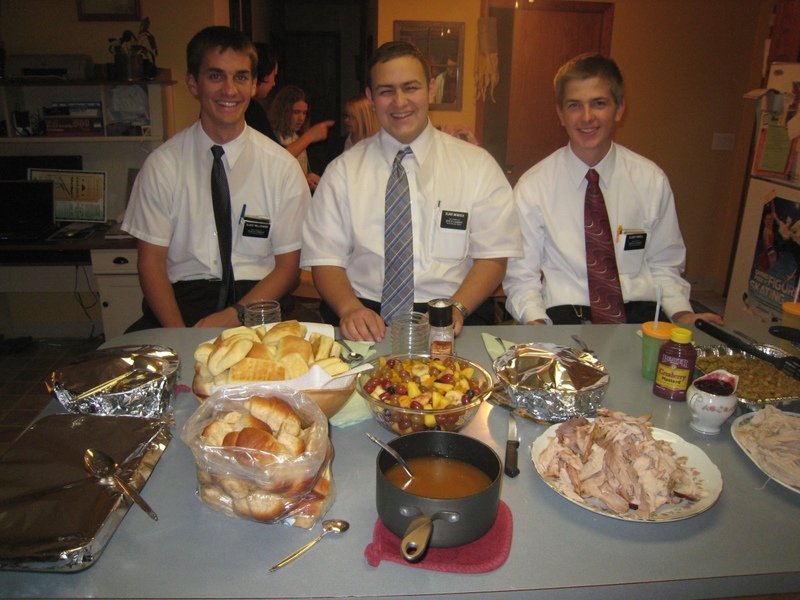 Thanksgiving dinner was great. We had tons of food and pie. And then we had more food and pie. Followed by some more pie. Then we just had some pie. The next day we had Zone Conference. President had all missionaries at Zone Conference for the first time stand up and had their companion introduce them. It was fun introducing two. 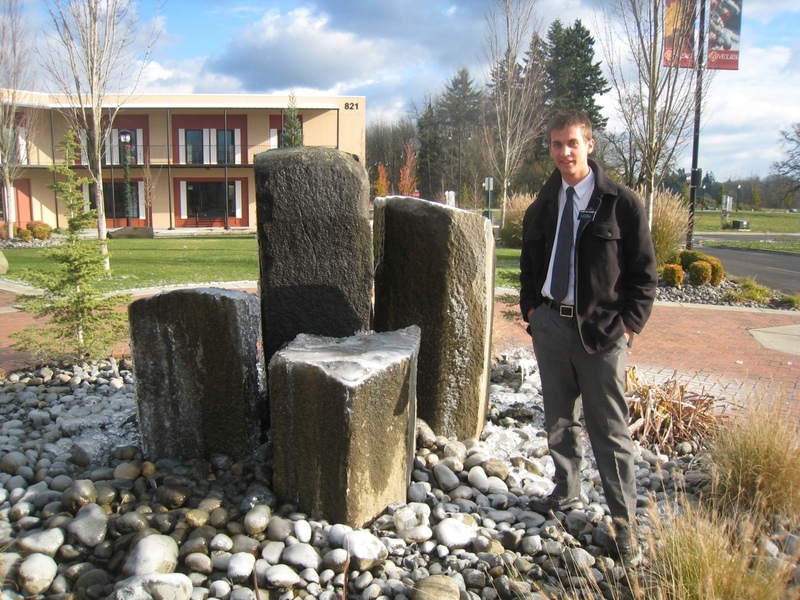 I bore my final testimony to all the missionaries there and enjoyed the things I was able to learn. I was asked how I achieved success throughout my mission and how was I able to do it. I said simply, “1. Rely on the Spirit and the Lord 2. Work hard! There is no substitute.” It was great to be seen as a great missionary to others, even though I have so many things I can improve on. We continue to work and find people to teach. We set a date with Phillip for his baptism on Jan. 15. That was very exciting to see him make that step of commitment. His dad and step mom are Mormon and call him on the phone and follow up with the lessons we teach him. He was referred to us back in September and has been very busy, but now is making great progress. I am also happy with the progress my companions have been making. I need to get them to a point where they can take over the area and be each other’s first companion past their trainer. It is such a crazy situation, but has been going great. As it so happens my zone’s temple day is next Tuesday and I’ll be going to the temple again the following Tuesday in Kennewick with President and Sister Greer before my flight. I am really looking forward to spending some extra time there. It will be a great time for reflection. I know this is the work of God and that it continues forward. He truly loves all of His children. Thanks for all the support and good luck with the wedding plans. The baptism of Roberta was great. The Spirit was strong and everything went very well. Roberta has such a sweet spirit and the ward has done great things in making her feel welcome. My new companion’s name is Elder Mendoza. He is from Sandy, Utah and is lots of fun. 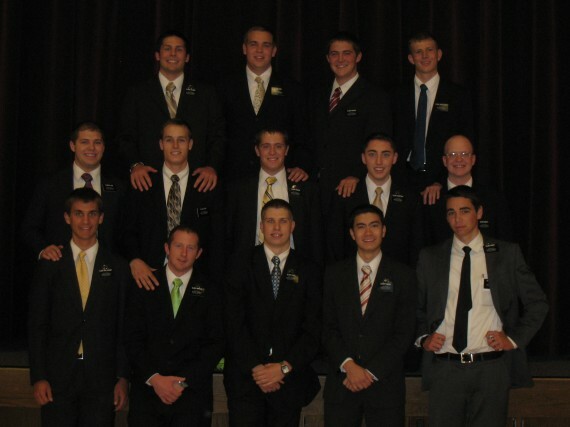 Elder Hardy was able to come to Roberta’s baptism so we got a pictures of all the missionaries I trained in a row. 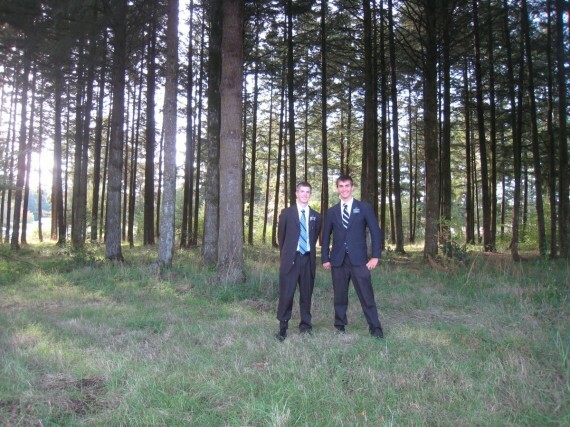 It was neat to see how much Elder Hardy has already learned in his short time away from me. He is working hard and has had great success. Elder Powell and I are adjusting to having an additional companion, but so far everything is great. I too am doing good, it wasn’t as overwhelming as I thought it would be, but definitely gives me plenty of things to do. Elder Powell has stepped it up a lot and Elder Mendoza has a great desire to learn. We continue to do all we can to bring others to Christ. The family sounds like it is doing great. Thanks for the continued support and emails. Unfortunately I spent too much time trying to figure out my camera and things that I can’t write much more. Until next week! What a great week. We finalized Roberta’s (by filling out her baptism record we found out how to really spell her name) plans for her baptism this weekend. She is no doubt the most excited person to be baptized that I have ever taught. To tell us the result of her interview she decided to have a little fun. 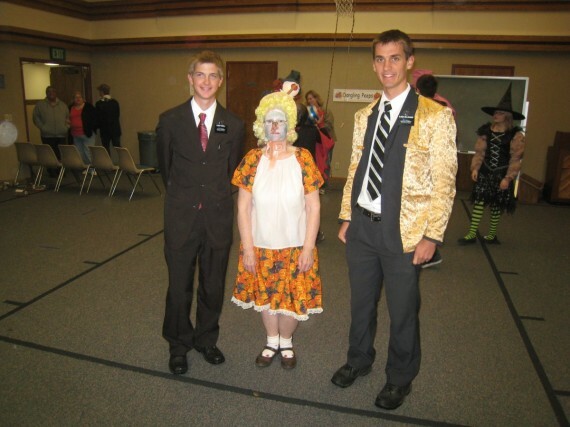 We all sat down and she looked at me and looked at the other Elders, winked at Elder Powell then at me. Then waited for about 10 seconds, started twiddling her thumbs then jumped up and said, “I passed!” We gave her high fives and congratulated her. It was funny. Yesterday, we helped her move around some furniture. We moved things this way and that way, back and forth, left and right. It took about a hour. You know… the average furniture moving process. 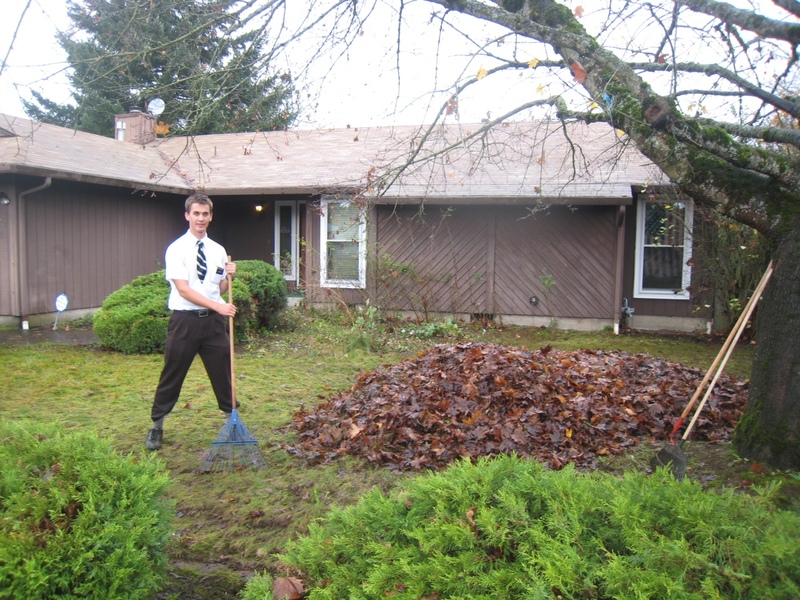 We also enjoyed raking some leaves which we planned on doing sometime during the week, but found a break in the rain so we worked in our proselyting clothes. It is refreshing to do some service for others. We had transfer calls on Saturday and this coming Wednesday is transfers. As I expected I’ll be staying with Elder Powell to continue training him. Three Elders in my district are being transferred so I’ll be able to meet the new ones and get to know them. Also Saturday I received a call from President Greer and he told me about how 18 new missionaries were coming this transfer to the mission. He mentioned how it was quite the load and then went on to ask me if I’d be willing to train another elder for the remaining time on my mission. He said, “We’ll try to maximize your talent before you leave.” I have never heard of something like it, but told President I would do it. I’ll be with Elder Powell and train him as well as train a brand new missionary to the field in a three-some. So basically train two at the same time. I thought for sure there would be no surprises, but you never know what is expected. I don’t feel like I am any different from any other elder who would be able to train, so it must be something President wants to happen. 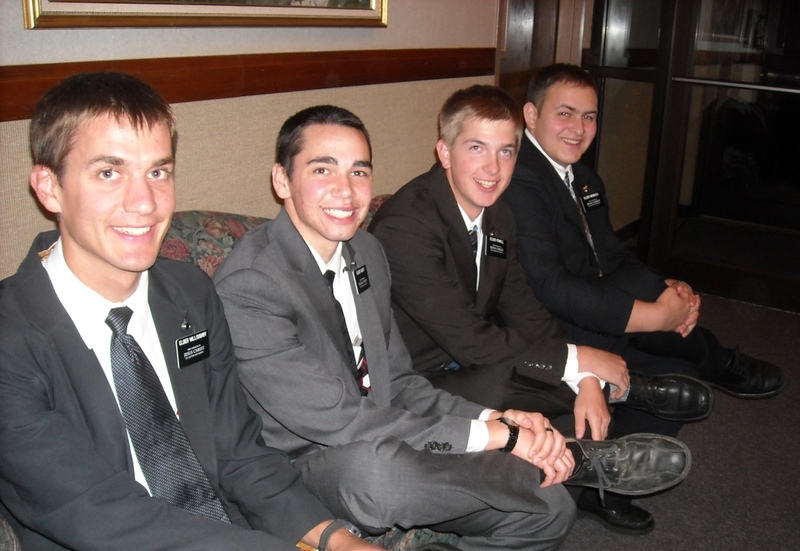 The mission at this point has many new missionaries. It’ll be another adventure, a new situation I’ve not been in before and we’ll figure it out as we go, trusting the Lord to help us. Luckily Elder Powell is doing well and we are planning on doing more splits with members to double our efforts each evening. So counting up responsibilities I’ll be on triple duty. I am very humbled by it and I know the Lord will help me as I do the best I can. The Lord will be doing most of the work. 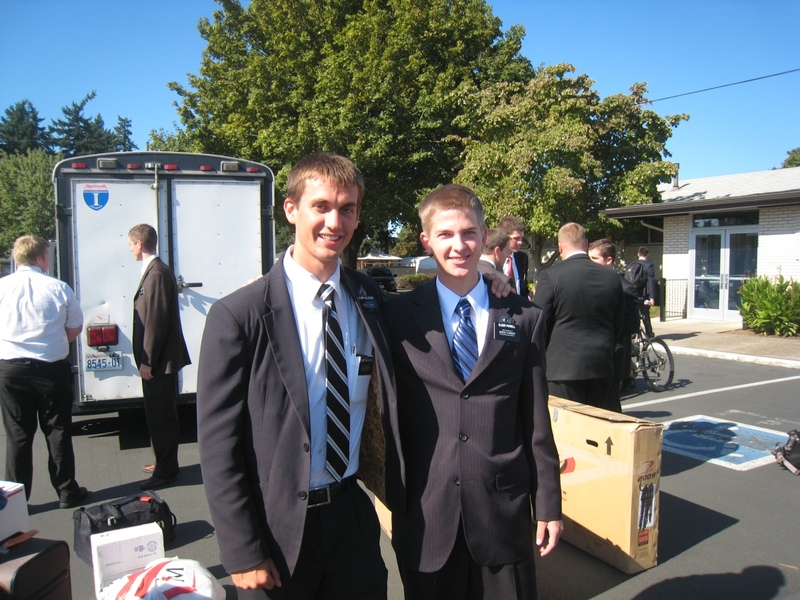 I have always liked new missionaries and I am excited to meet my new final companion. I liked how the stake went over to being online missionaries. 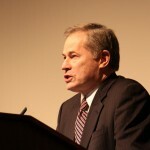 President Greer received a letter a month or two ago encouraging missionaries to encourage members to go online. I have never had the chance to really look at Mormon.org, but we encourage members every time we see them to go on the website and make a profile. I can see great things happening from it. As we have been tracting each week, it tends to be that we find people to teach, but they drop off over the next 2 to 3 weeks. So it isn’t completely ineffective, it just doesn’t work too well. I counted just the other day and since I have been here we have found and then dropped or been dropped by 30 investigators. The people that continue to meet with us from week to week either have really good Mormon friends or they were member referrals in the beginning. So I can say that Mormon.org is a great approach to finding people! Good job Dad at being there already. 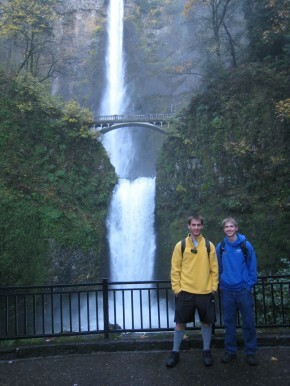 We had a fun trip last week to Multnomah Falls. 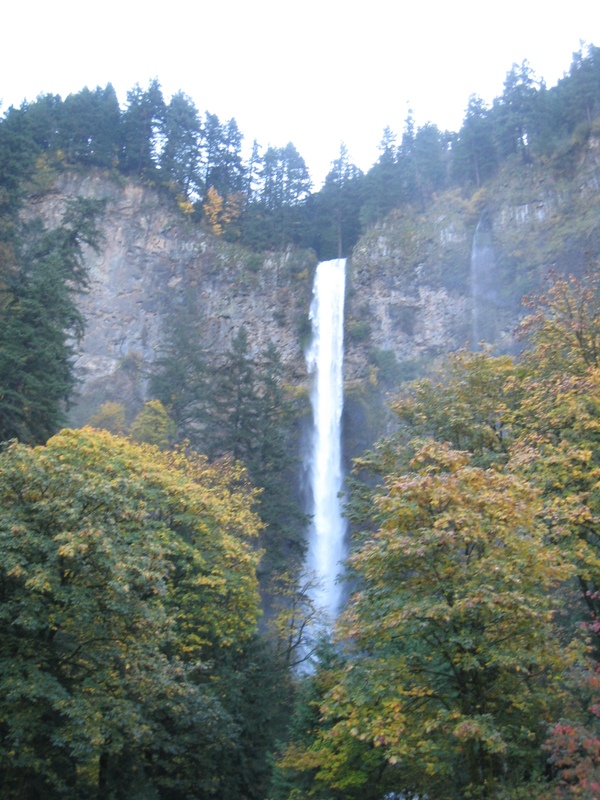 It is a big water fall and water certainly falls there. 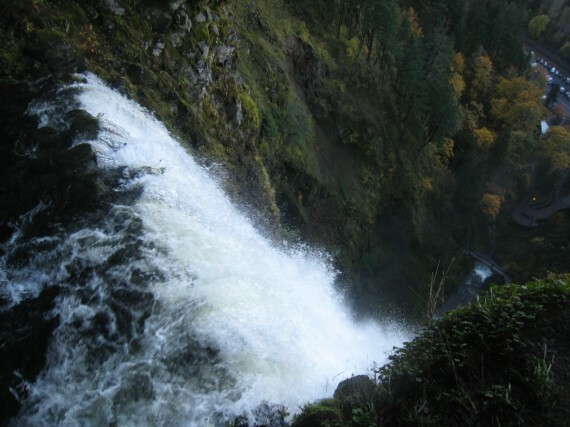 We hiked to the top and looked over the gorge. My companion and I ran down in half the time it took to get up. My legs were sore till about Saturday from that because of the impact of running downhill. It was well worth it. Raberta is going to be baptized on November 20th. She is really excited about that and so are we. She is loving everything about church. We are also teaching someone named Hope. Its always a nice joke to say, I hope she’ll be there. Our week was spent doing some service for a member that was moving and teaching many people that we have been working with for awhile. We are striving to find more people to teach and have been doing more tracking, asking members to help, and talking to people on the street. I always enjoy meeting people on the street and talking to them. I have found that is when people are more open to letting us come to their house. It has been the main source of finding new investigators. There were two to three members that wanted to feed us for Thanksgiving. It was first come first serve on the sign up sheet. 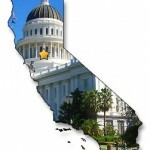 It is crazy that it isn’t that far away. We are going to have Zone Conference the day after and I’m excited about that. Elder Powell is learning quickly and he took the lead more this week. He is learning the area very well and it has been more of a focus for us this week to teach him all the knowledge I have of the area. I’ve never been in an area this long and it was amazing to see how many people I’ve actually taught, talked to, and know where they live. I have the location of every street in my area memorized and can give step by step instructions to any place from where ever I am. The investigators we have been working with for a while I can name off their address. It is cool how that kind of thing just comes. Anyhow this is the knowledge that we are working on getting Elder Powell to know so that he can lead his new companion around. It’ll be an exciting month ahead of us. I hope all is going well, I know that the Book of Mormon is true! We went to the Halloween trunk or treat. Raberta came and showed off her costume. I decided to turn my suit jacket inside out. It definitely is awesome. Yes, there are dragons on my bright gold yellow inside of suit. It is my favorite. We’ve been working with Raberta more and more and she is progressing well. We have also worked a lot with Keelin. He is 10 years old and understands very well. We were teaching him about the baptismal covenant and were saying that we can renew it when we partake of the sacrament. He added in, “Yeah and doesn’t the bread represent his body and the water represent his blood?” We were taken back a little as we aren’t used to investigators saying things like that — even though it is common knowledge. He is simply a very smart kid and taught a bit by his member grandma. The candy was great. Thanks for sending the shirt as well. We stayed at our apartment for Halloween because President told us to. We have been working and recently found some new investigators which always brightens what will come. It is awesome to have served for 2 years. It is somewhat strange to still be serving, but at the same time I am very grateful. There is no better way to spend the time I have. I’ll see if someone in the ward can measure me for my tux. I’m sure that they can work with measurements I get. It sounds like the wedding plans are working out quite nicely. Happy Halloween. Today we are going on a hike with our Zone. So it is exciting! Thanks for all the support. Thanks for all the great emails. I am glad that everything is working out good. We had a great week again. It always gets better and better. Raberta (the 73 year old investigator) came to church again. She is not shy at all and has lots of energy. She loves Relief Society and calls them her sisters. She absolutely loves church. She tells everyone how many churches she has stopped going to because she wasn’t comfortable. She feels comfortable around us and she told Relief Society how she was going to be baptized. They told her to then learn the lessons and make sure she understands things. It is quite the experience. Raberta is really excited for the Halloween party or trunk or treat. She is going to be a witch and she gave us a preview of her witch laugh. It was so real it freaked us out. It’ll be lots of fun. We experienced a little bit of the rainy season on Sunday and yesterday. It poured buckets of rain and then rained some more. We were tracking for part of it and got really wet. Lucky we had a dinner appointment soon and the members helped us dry off.It looks like I’ll be using my winter Mongolian clothes that I kept in my suitcase, so that works out well too. The wool socks have been a great investment. Steven’s rain coat he never used works really well. 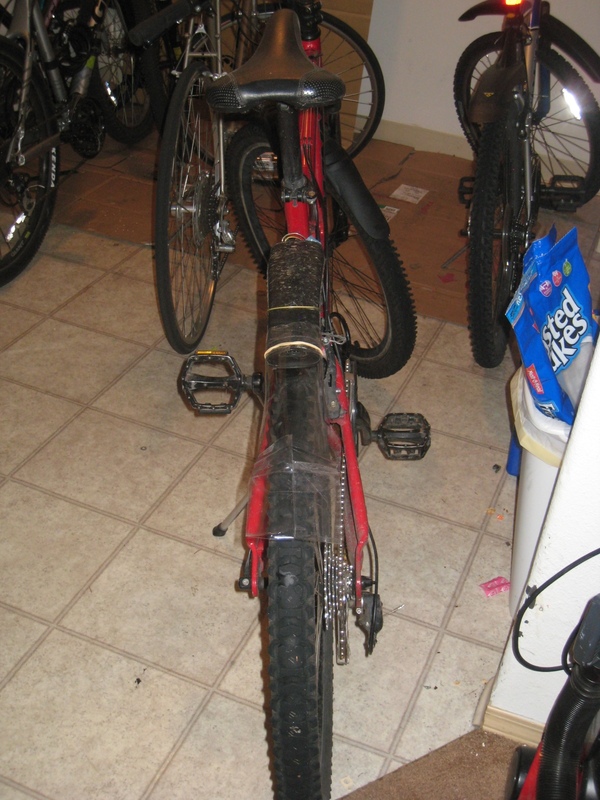 I fixed up some broken bike fenders that were here in the apartment. I adapted a coat hanger and attached it to the bike. It wasn’t quite long enough so I cut some plastic off of a cinnamon roll case and it works just like a normal fender. I was very pleased with it so I sent a picture. The scholarship looks great. I had no idea it was four semesters. That is even better! Sounds like everything will be taken care of for me. Thanks for all the sacrifices you have all done to allow me to serve my mission. I know the Lord has blessed me as I have served and continue to serve. 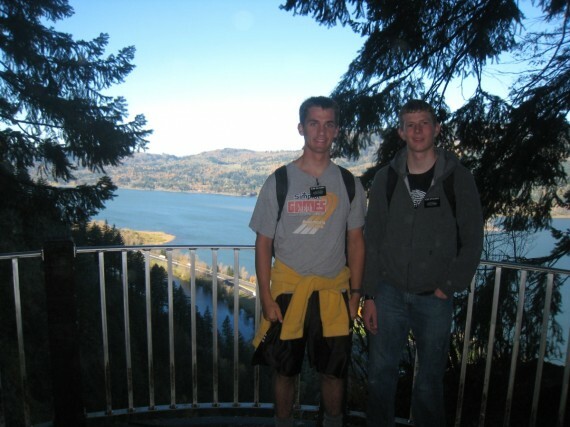 Elder Powell and I have been doing great. We have continued to work to find those prepared for the message we have. With that we have increased our finding efforts and are seeking people who are ready to make commitments and leaving some behind that haven’t progressed for a long time. It has slowed the work up a bit, but in the long run will help the area the most. We have one investigator that is 73. She always asks us when we come over that she feels something different about us and that she is comfortable around us. She is quite the crazy lady, but has a very sweet spirit. She came to church with us and loved church. She was a little more outspoken we heard in relief society, but nothing to worry about. :) I hope the best for her. As a good brother would do, I knew that Jake was planning to get engaged for about a month now. With that it made me really think about extending for quite some time and made the decision rather tough. 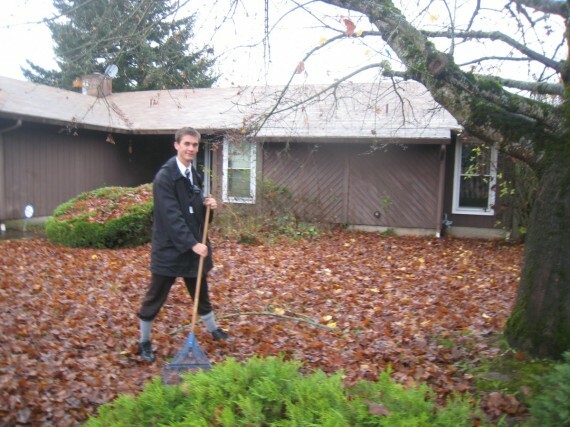 I think I said before, I really enjoy being a missionary so any extra time here would be great. So I went ahead and made a decision and found out last week when the actual wedding was. As it turns out, I’ll be coming home December 14, my flight leaving around 1:15 pm (with some special arrangements from President). It seems it’ll be quite exciting having so many big events so close together. I don’t think I’ll have any jet lag from the flight for the wedding so that will be a bonus. Just think about it Mom, having one son get married and one come home from a mission is a great Christmas present that happens to be 10 days later. I think I’ll count Rachel lucky. Usually there is a series of tests I do in order to see if I’d be willing to have a new sister-in-law. Adelaide did fairly well on the tests… ha ha. Anyway I was thinking it would be a good idea to get my college figured out before then. What do I have to do? What information do you need from me? I think I can get permission from my President to arrange some things online here if I have to. I’d like to start as soon as possible to clear things out of the way. Especially since it is a week by week communication going on. Thanks for everything you do family! My new companion is Elder Powell. He is from Gilbert Arizona and is a great person to be with. 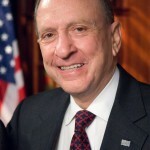 I’m excited to work with him with the short time that we have together. We worked very hard to get investigators to church this week. After transfers we spent Thursday, Friday and Saturday teaching our investigators what church will be like, setting up rides, and confirming that members can take them and sit by them. I don’t think we’ve ever made more phone calls and talked to more people in attempts to get people to church. All of them were excited and were very willing to come. With every forward effort there is opposition. On Thursday I got a bloody nose and a flat tire (I’m okay now). Sunday morning as we saw our hard work fall apart I got another flat tire in the rain. Calls from investigators and talking to them later we found out that one investigator had to care for his mom’s poor health, one got sick and couldn’t come, another her parents didn’t want her to go, and the other had to go pick up her kid last minute. Two completely forgot even though we were at their house the night before, three went on vacation and one mentioned that she doesn’t want to come because she feels she doesn’t belong at our church. I admit I was discouraged sitting at church. With the high hope that all could make it, we were sure we had at least six that would be there. I realize that we did all that we could and things just happen. But it wasn’t until our new member Stephanie came in and she sat next to us that made me feel much better. It instilled in me a new commitment this coming week to again attempt to get people to church, teach them with the Spirit and help them feel of Heavenly Father’s love for them. With all our efforts to do something good, it seems sometimes the opposition will overwhelm and win. I know if we press forward with faith great things can happen. This is the Lord’s work and he will be there. We ended up having two investigators come, that have come before, and continue to enjoy coming to church. To see them smile makes it all worth it. I love being a missionary! Thanks for all the letters of support. General Conference was great! I really enjoyed everything that was taught. It felt like they gave all the members encouragement and I could feel the love that they have for us. My favorite talk was from President Uchtdorf on simplifying our lives. I try to live a simple life. For example you will notice for the past four and a half months I have worn one tie per transfer. It started with dark green, then light green, now yellow. The same tie every day for 42 days. The next transfers tie (which starts tomorrow) has been selected, but I haven’t yet selected a tie for my month extension. There is competition among missionaries in my zone campaigning for the tie which I will wear. They want theirs to be picked. This in turn simplifies my life more because I don’t have to buy any new ties. Other ways to simplify my life are: Wearing a white shirt and slacks every day. I really enjoy General Conference. I hope to become more positive and express more gratitude for all that I have. 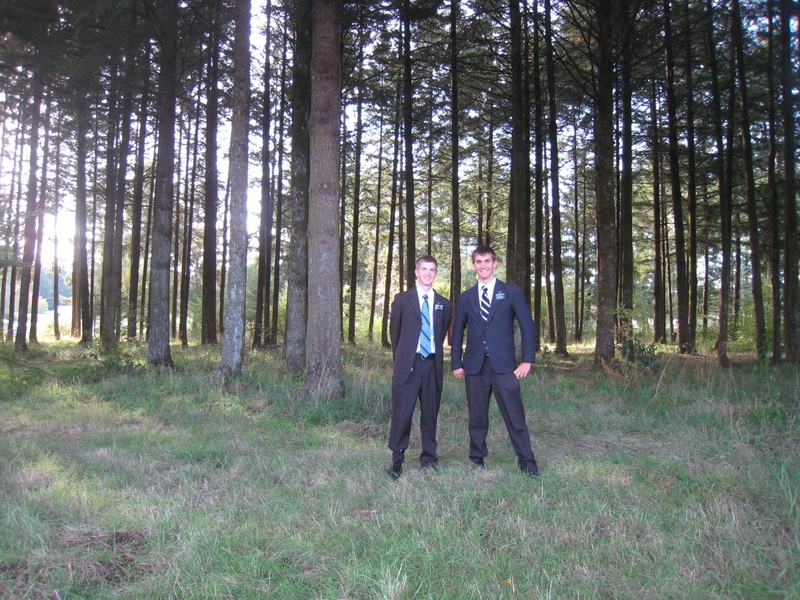 Elder Hardy and I had a great last week together. 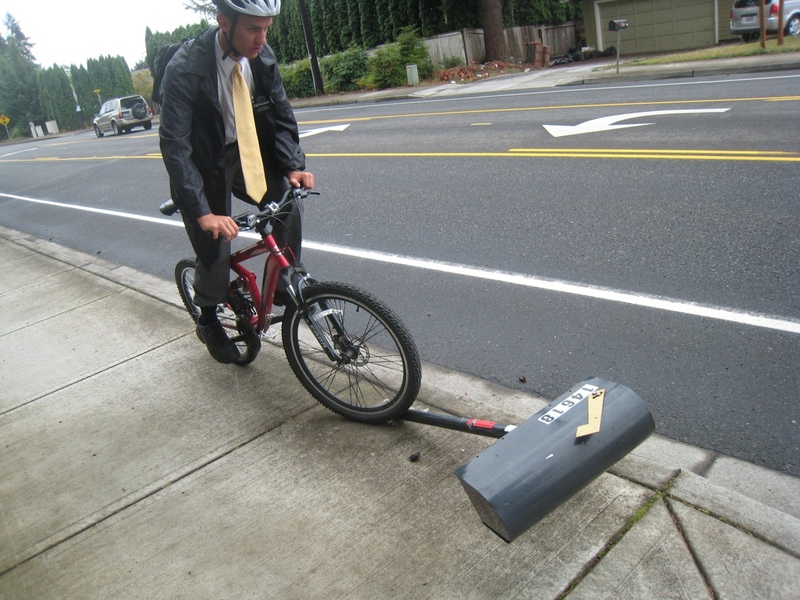 Transfer calls came and Elder Hardy will be transfered. I’ll get a brand new missionary tomorrow to train. I’m excited to train again and at the the same time sad to see Elder Hardy leave. He is a good companion. He’ll be great missionary! President comfirmed my extension, but so far I don’t think there is any more updates on flight plans. I’m sure they’ll figure it out when it comes time. Thanks for all the support and have fun on your cruise!